Toddlers soon learn to put on their own masks. 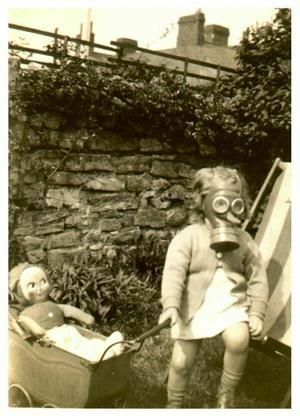 Let them make a game of it and they will wear their gas masks happily. 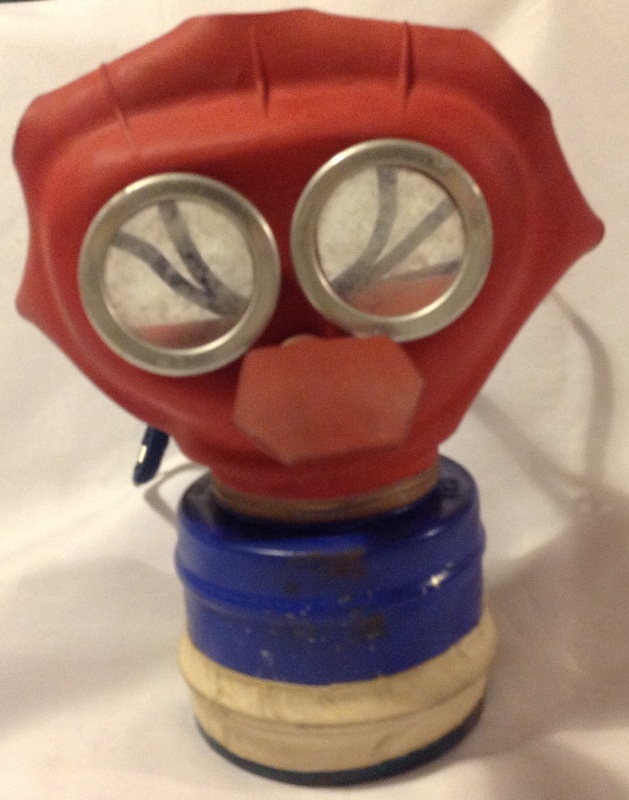 This respirator was designed for children sufficiently developed to wear a respirator, but not big enough to be satisfactorily fitted with the small size Civilian Respirator. 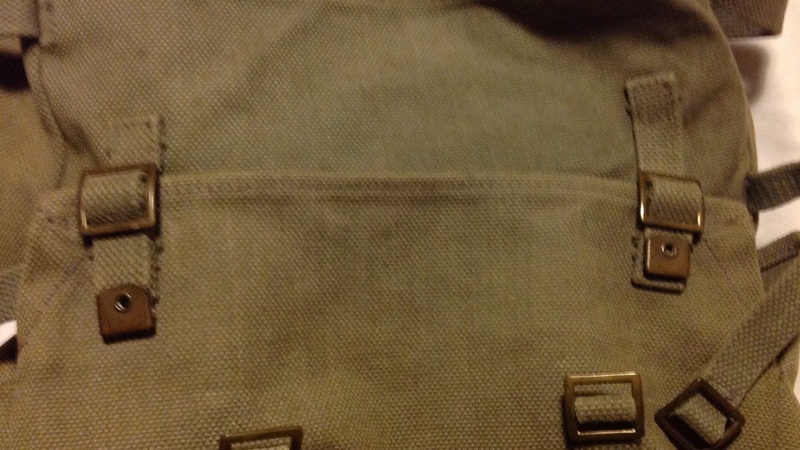 As a rough guide it was suitable for children between the ages of about 18 months and 4 to 4 ½ years. 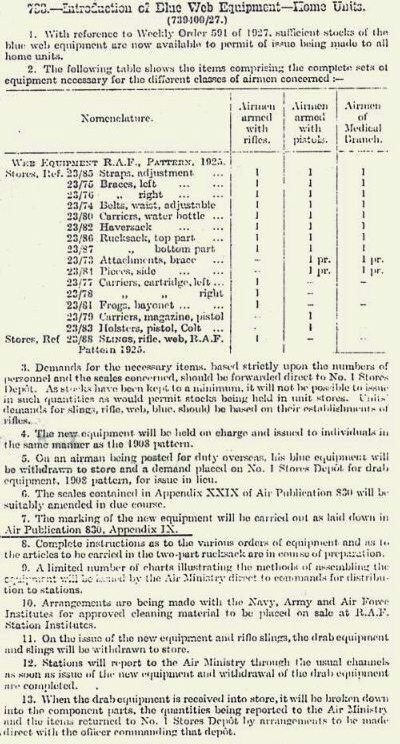 Some Children below the age of 4 years were fitted with the small size Civilian Respirator. It consists of a thin flexible moulded rubber facepiece with separate eye-pieces of non-inflammable transparent material: and an outlet valve. 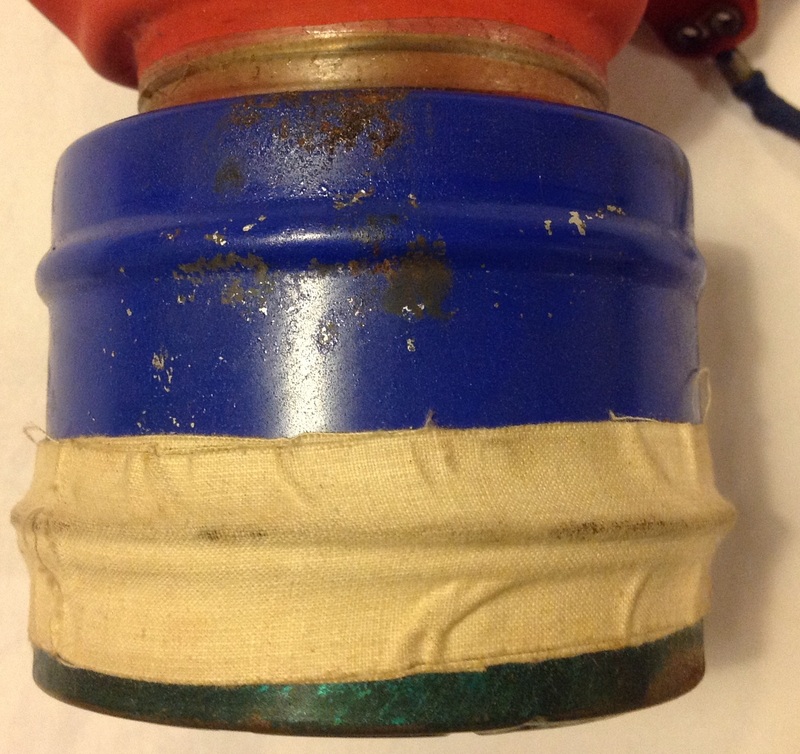 A container is screwed into a metal mount on the front of the facepiece: This container, though smaller, gives the same degree of protection as that fitted to respirators for adults. 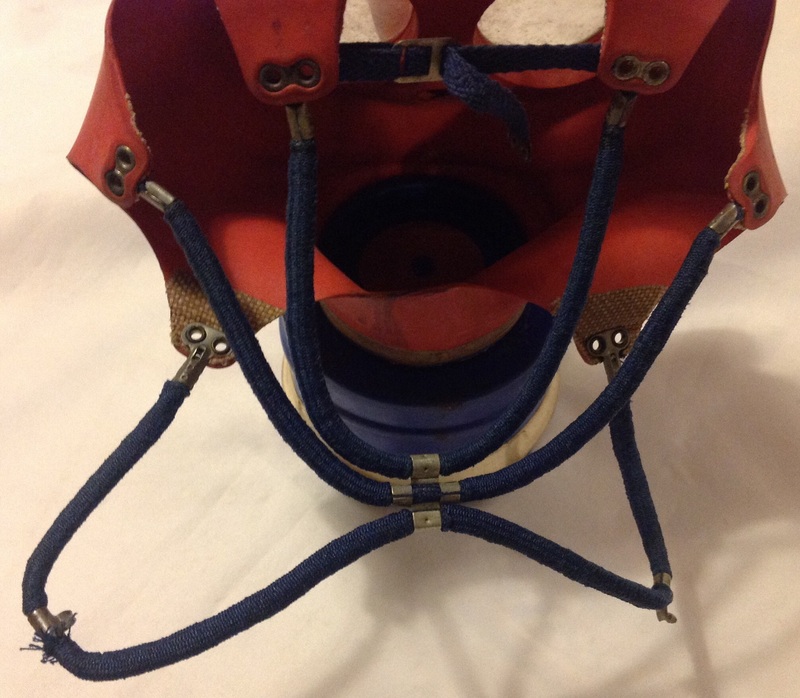 The respirator is held in place by a head-harness formed of coiled springs enclosed in cotton braid: The head harness is not adjustable but the tension and flexibility of the springs is such that the facepiece is held in firm but comfortable contact with the face. 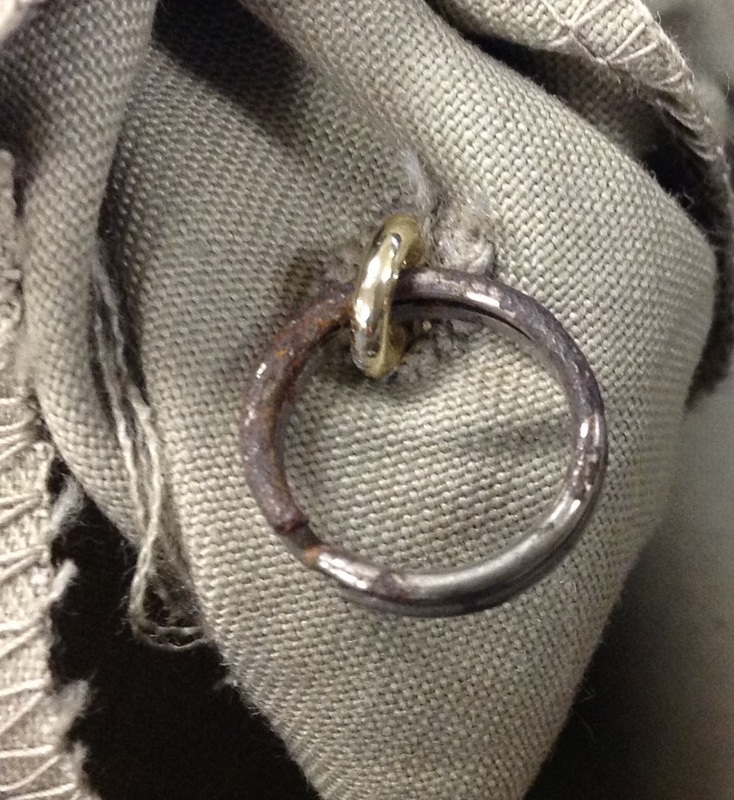 A hook and eye attachment to the two lower springs of the head-harness enable them to be hooked together at the back of the neck which prevents easy removal of the respirator by the child itself. 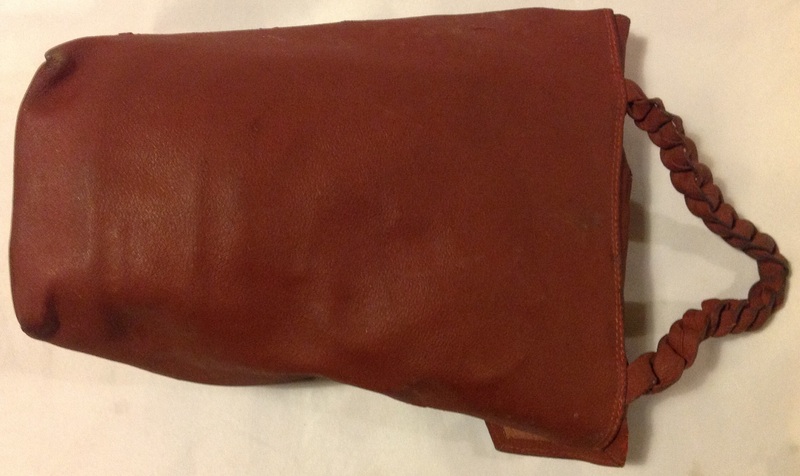 A stout cardboard carton with a sling was supplied with the respirator to contain it when not in use. 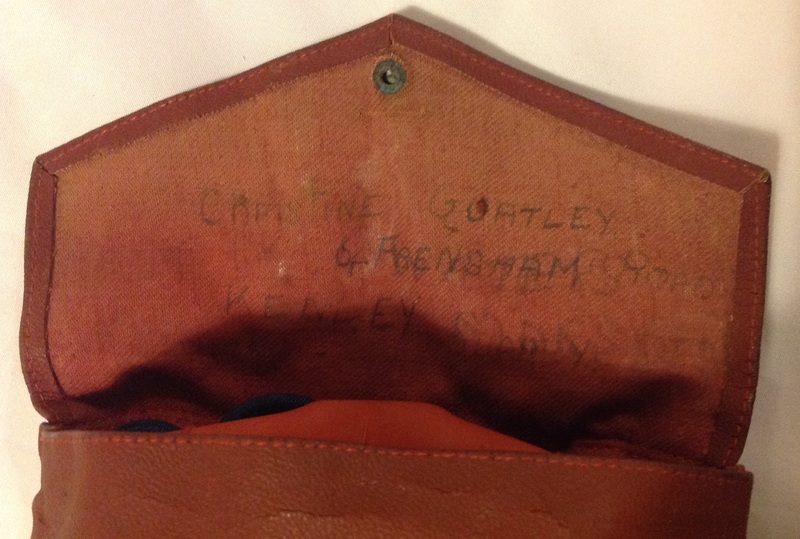 This gas mask, as is often the case, has lost its cardboard carton and had it replaced with a more durable and attractive leatherette bag in russet brown: Inside the bag is the name of the original owner, Charlotte Goatley, pencilled inside along with her address: This was a wise precaution as gas masks were frequently lost or forgotten! 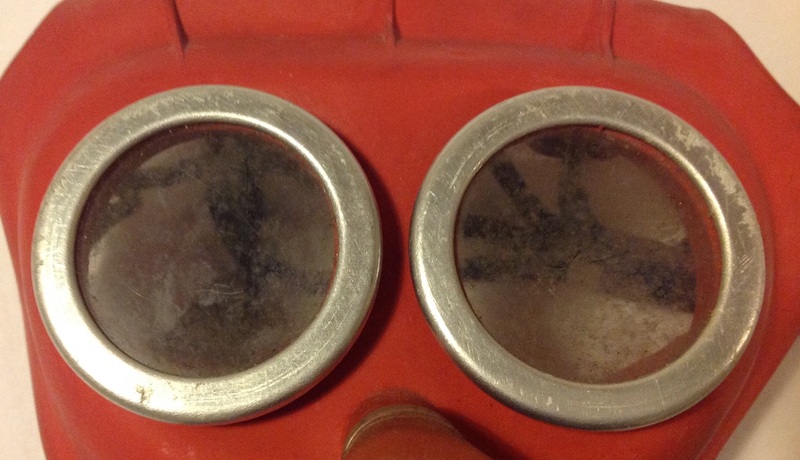 The inside of the mask has a printed date which puts manufacture at 18th April 1940: Apparently toddlers soon learnt to make rude noises to annoy their parents when breathing out through the flapper valve on the front, the rubber making a sound like a whoopee cushion! 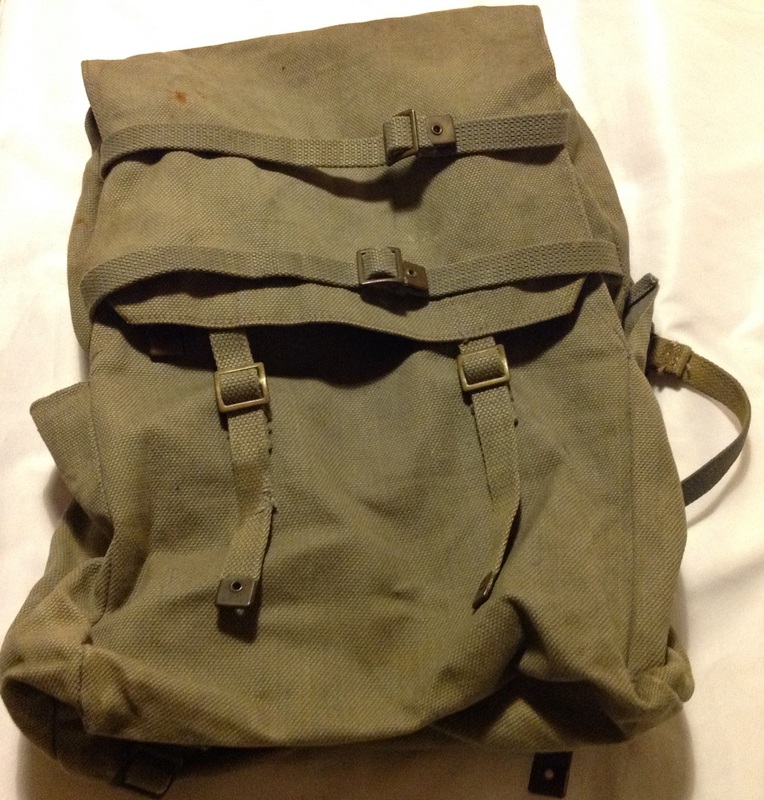 This entry was posted in Gas mask, Home Front, Latest Pick Ups, WW2 on December 31, 2015 by hatchfive. 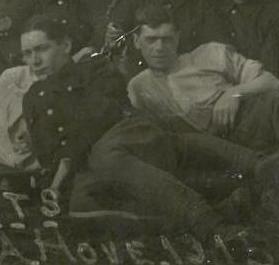 CVI Brigade, Royal Field Artillery, served with 24th Division. 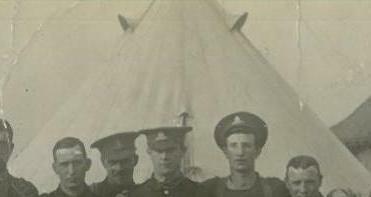 The Division was established in September 1914 as part of Kitchener’s Third New Army and began to assemble in the area of Shoreham. 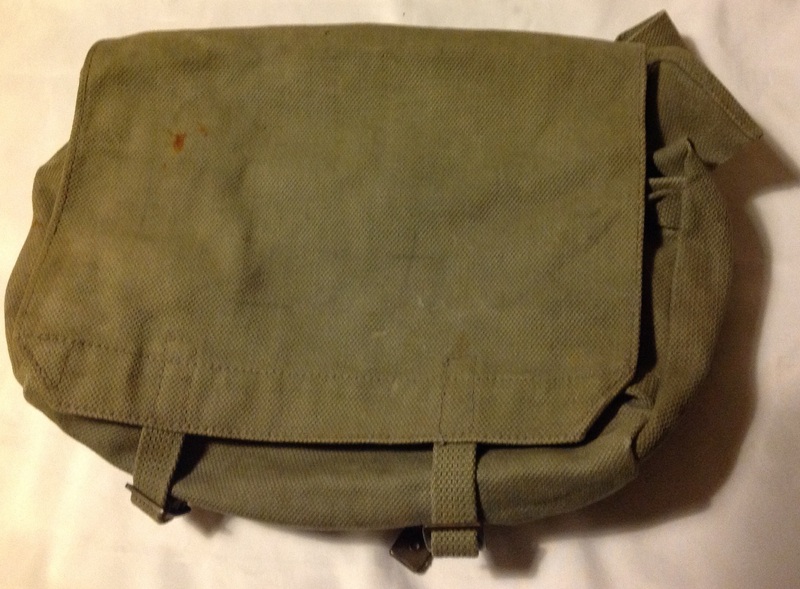 The division suffered from a lack of equipment and a lack of trained officers and NCOs to command the volunteers. 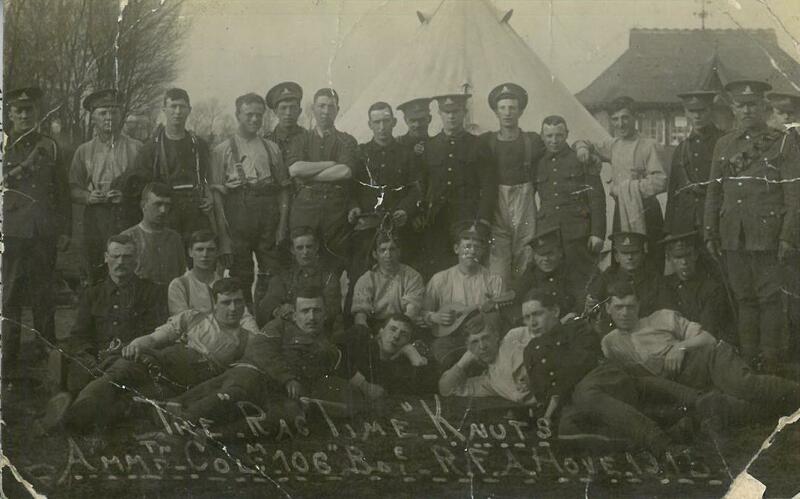 In late June 1915 they moved to Aldershot for final training and they proceeded to France at the end of August. The Division concentrated in the area between Etaples and St Pol on 4 September and a few days later marched across France into the reserve for the British assault at Loos, going into action on the 26th of September and suffering heavy losses. In 1916 they suffered in the German gas attack at Wulverghem and then moved to The Somme seeing action in The Battle of Delville Wood and The Battle of Guillemont. In 1917 they were in action at The Battle of Vimy Ridge in the Spring, The Battle of Messines in June and Third Battle of Ypres in October before moving south where they were in action during The Cambrai Operations when the Germans counter attacked. 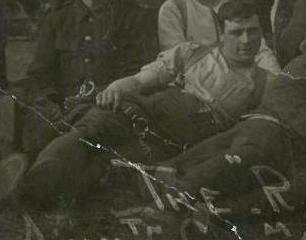 In 1918 they were in action on the Somme and The Battle of Cambrai and the Final Advance in Picardy. 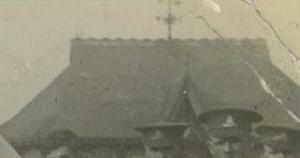 At the Armistice the Division were in the line 1.5 miles east of the Maubeuge-Mons road. They moved back to the area between Denain and Douai at the end of November moved to St Amand-Orchies, then on the 18th of December the Division moved to Tournai for demobilisation, which was completed by 26 March 1919. 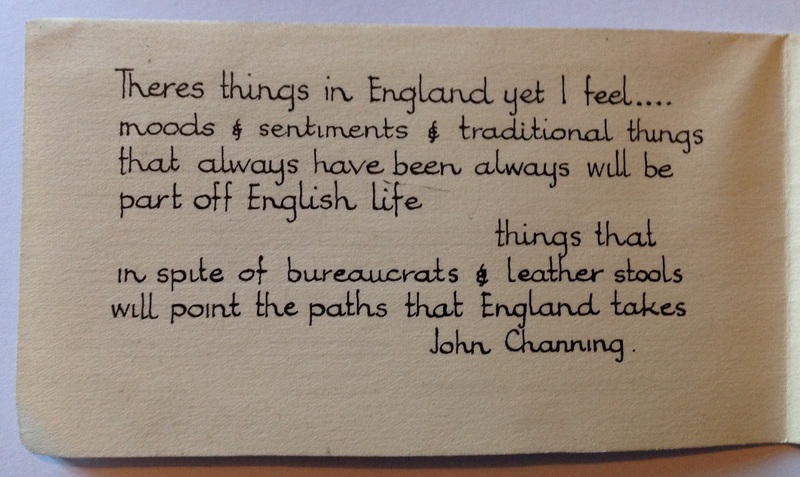 This entry was posted in British Army, postcard, WW1 on December 30, 2015 by hatchfive. This entry was posted in Uncategorized on December 30, 2015 by hatchfive. 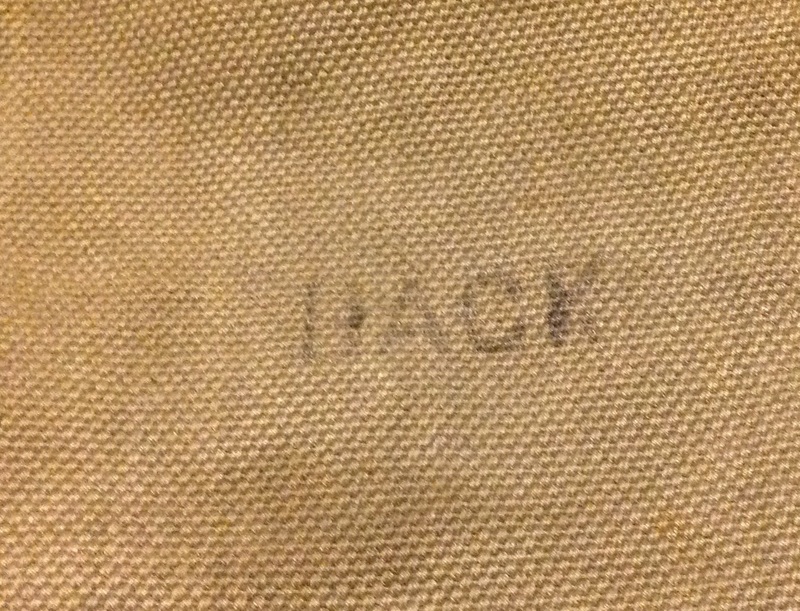 Objects made by the soldiers themselves in the front line. Objects made by those convalescing after injury and prisoners of war. 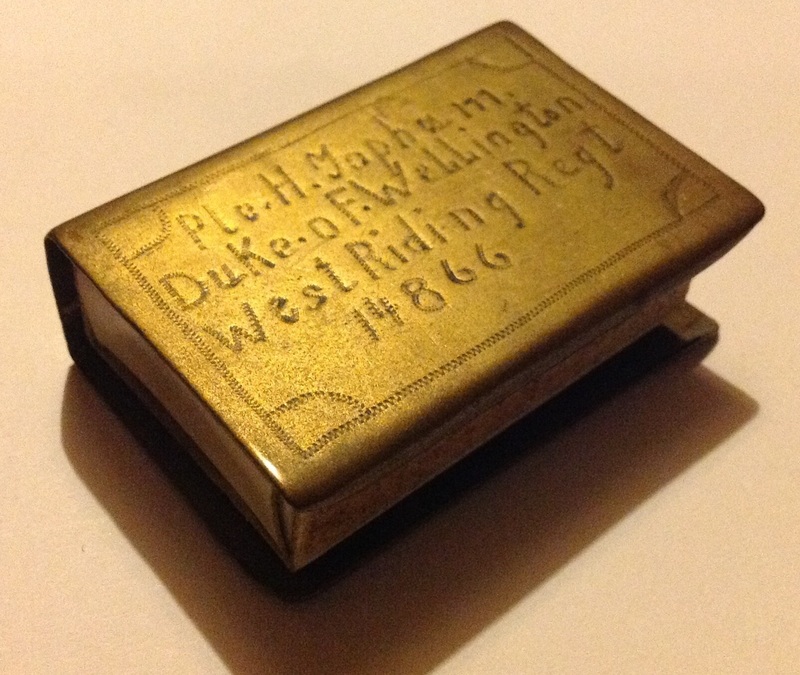 Items made locally by civilians either during or after WW1 for sale to troops and tourists. 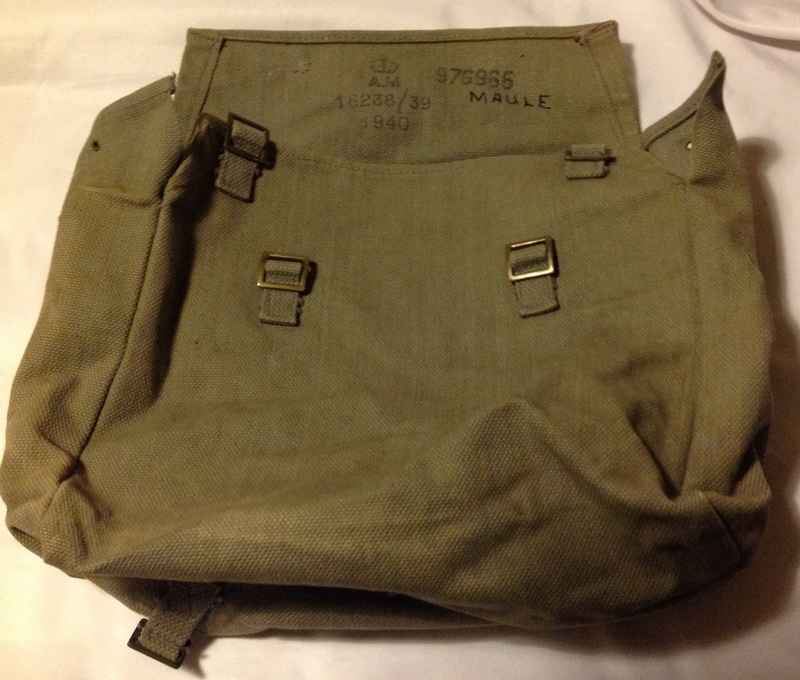 Commercially made pieces using military surplus sold after the war. 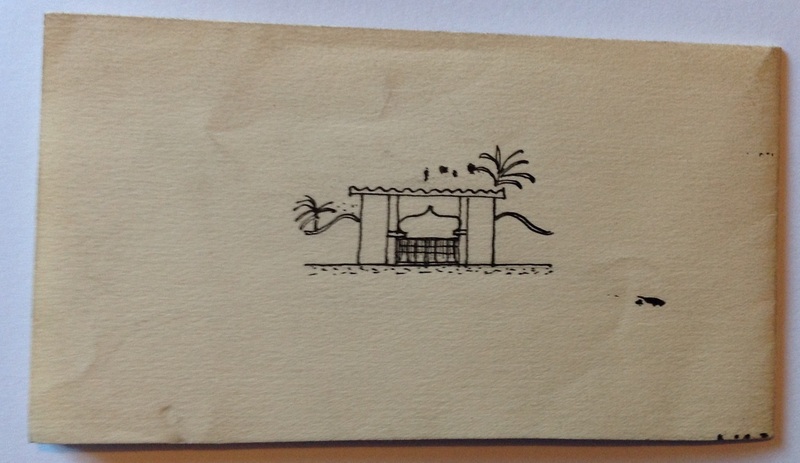 As can be expected these pieces range from the very crude (like my matchbox cover) to beautiful pieces of art. 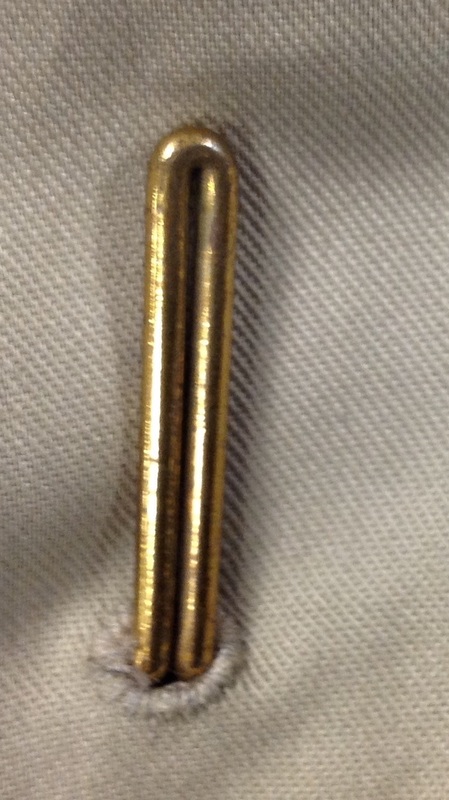 Often the quality is dependent not only on the individual making the item of trench art, but also the tools available to him. 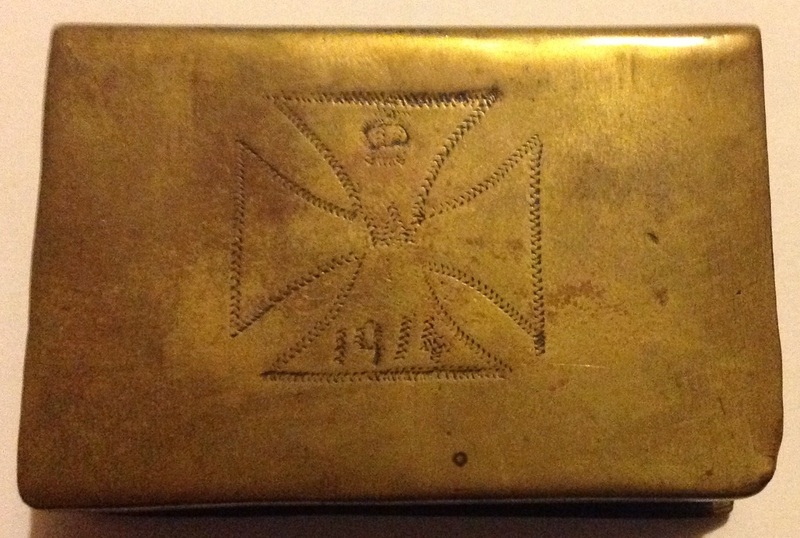 A soldier in the front line might only have access to a nail or his pocket knife to engrave his object, a soldier working in a Royal Engineers field workshop would obviously have more tools and probably more skills so could turn out a more refined piece. 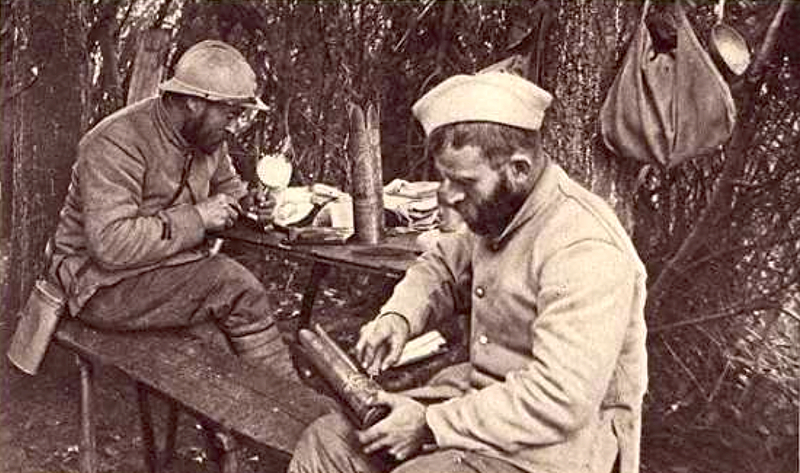 Here we see some French Poilu making trench art vases from shell casings: Happily this is one area of WW1 collecting where there are few reproductions- the thousands of man hours needed to make a piece far outweigh any monetary value it might have so most pieces are original and date to WW1 or the immediate post war period. 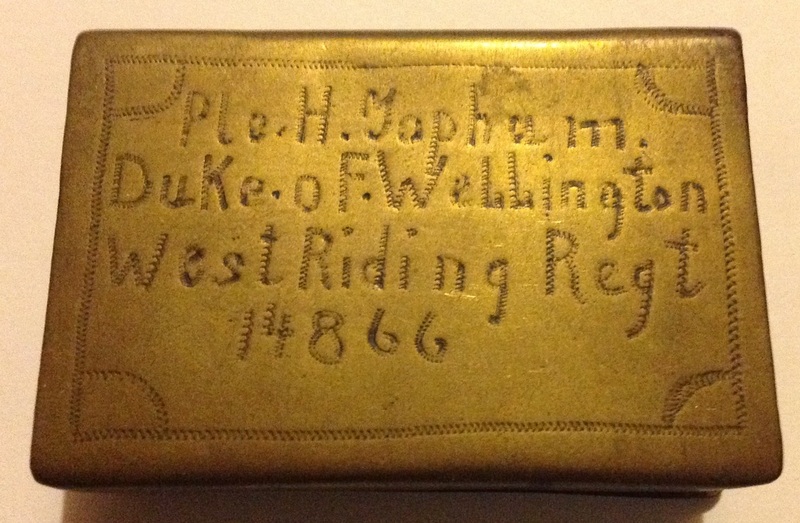 This entry was posted in British Army, Souvenir, WW1 on December 29, 2015 by hatchfive. 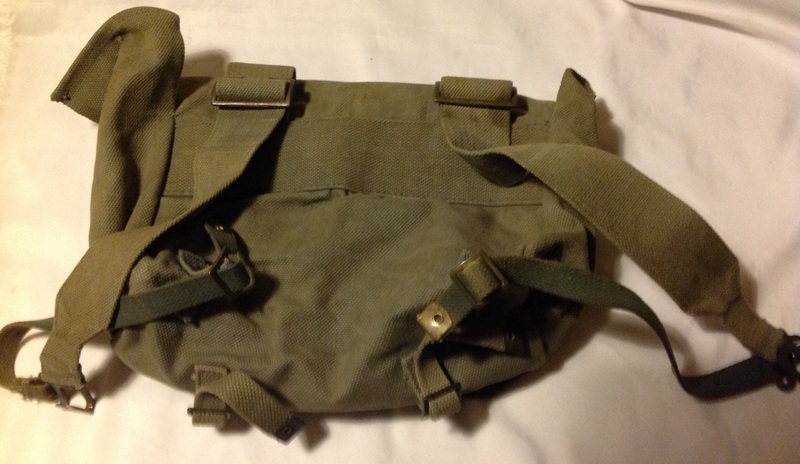 The run up to Christmas saw the secondhand market in Huddersfield go through one of its periodic ‘dry spell’ for militaria with very little worth picking up. 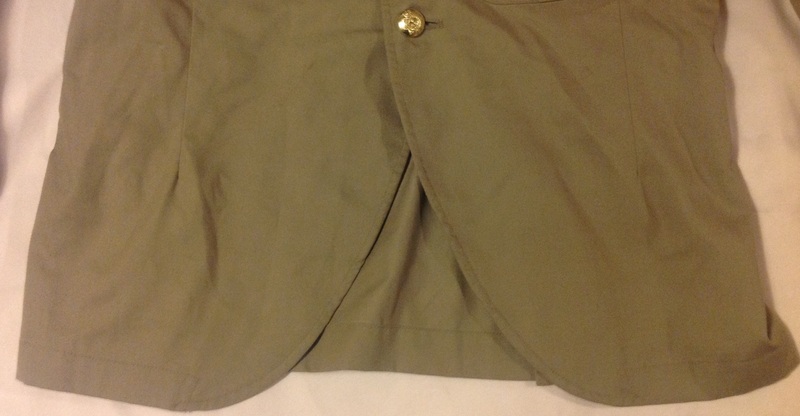 One nice item that did come up to break the monotony however was this British Army No6 Scottish uniform tunic: This light tan uniform, known as a ‘bush jacket’ was for ceremonial wear on parade in the tropics and replaced the old KD cotton uniform used up until the outbreak of World War Two. 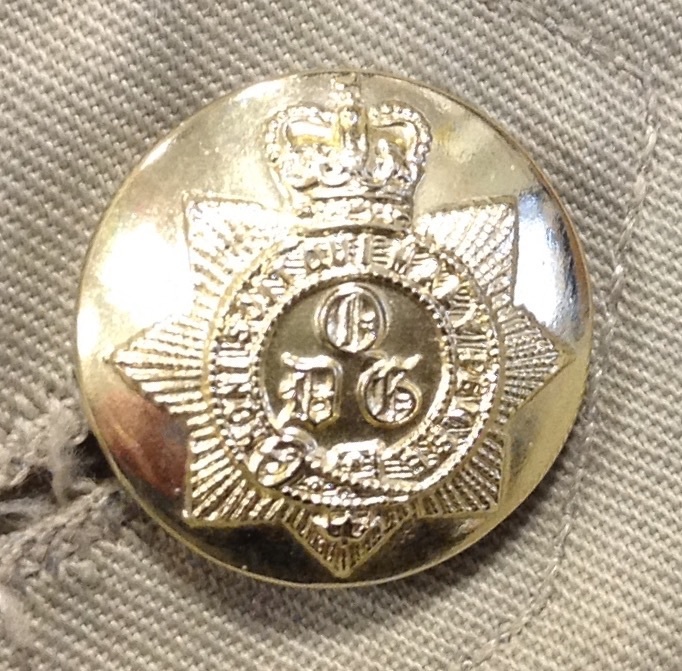 Being a parade uniform it features staybrite regimental buttons: In this case they are for the Queens Dragoon Guards (I don’t know why these are attached as the regiment shouldn’t have a scottish pattern of jacket). 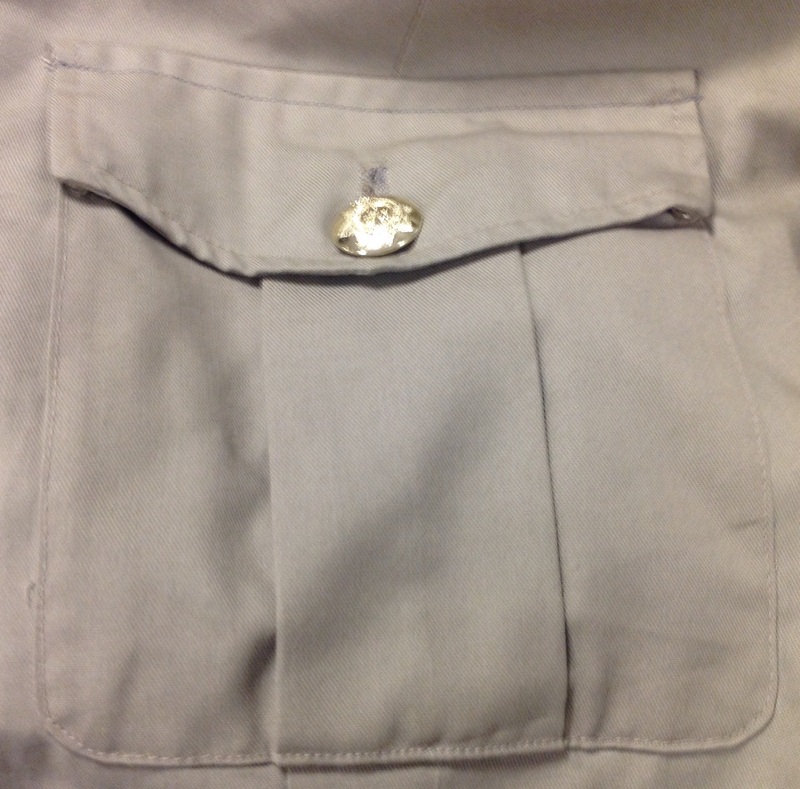 The buttons are secured to the jacket with split rings to allow them to be removed for laundering: The jacket itself has pleated patch pockets on each breast: And the usual pair of shoulder straps: The most distinctive part of the jacket is the ‘cutaway’ front to allow it to be worn with a kilt: Two metal belt hooks are provided on each side to support a belt in the correct position: These are supported by cloth tabs inside the jacket to help distribute the weight and prevent them from twisting: A label is sewn into the back of the jacket identifying the type of uniform, its size ‘4’ and laundering instructions: The label allows us to roughly date the jacket to the 1970s approximately- metric sizes taking over shortly afterwards. 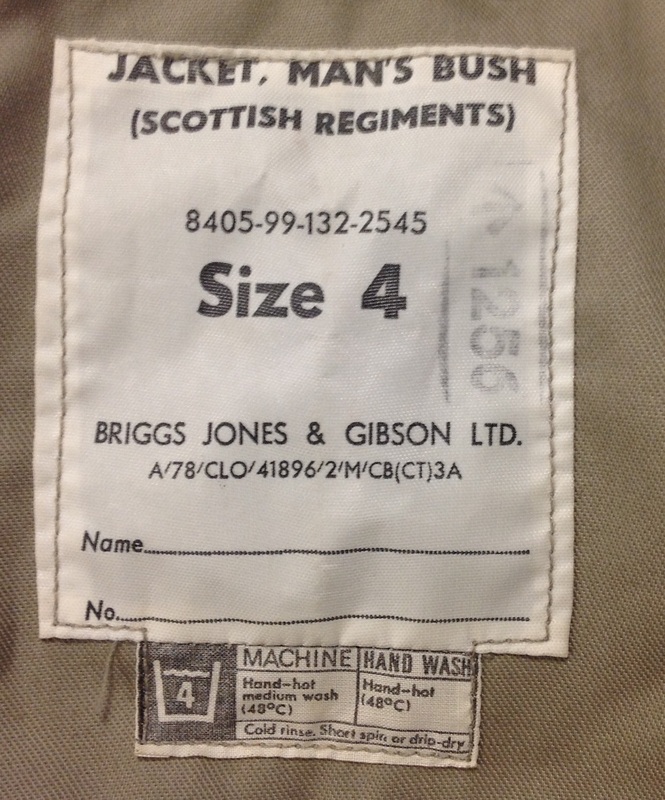 The jacket was made by Briggs, Jones & Gibson; a clothing firm with factories in Manchester and Stoke on Trent. 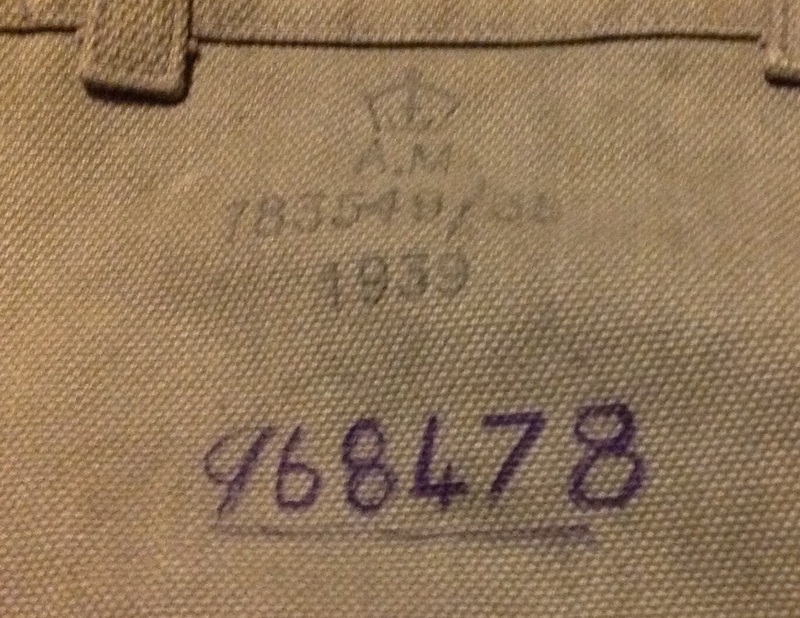 The company had been founded just after the turn of the twentieth century and specialised in producing uniforms for bus companies and the military- World War One they had won substantial government contracts to make uniforms for the army- something it was to continue to do for many years to come. 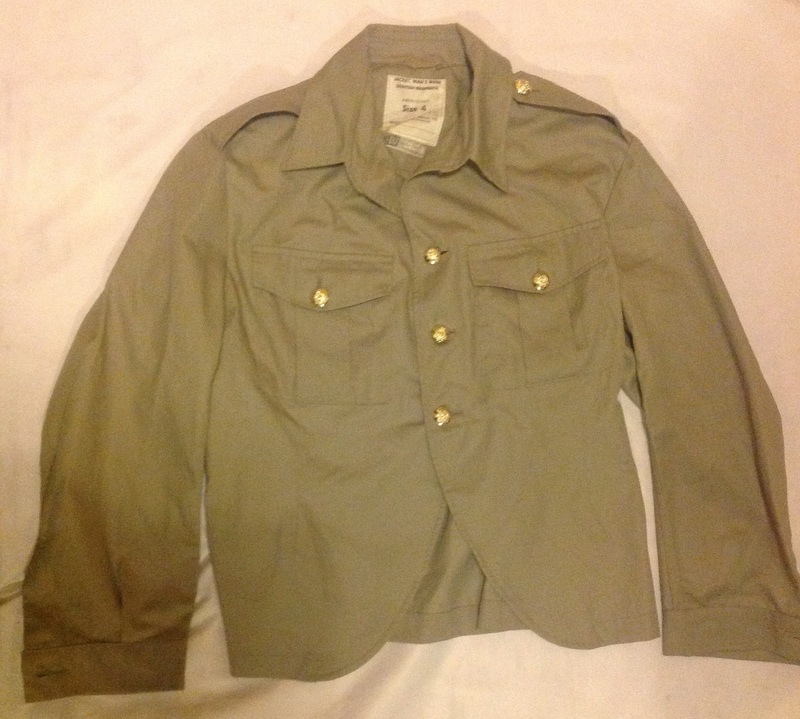 It does seem to be pretty hard to find much information on this particular design of jacket, even a search by the NATO number has not brought up any information, so as ever if people can help with further details or photographs of the jacket in use. 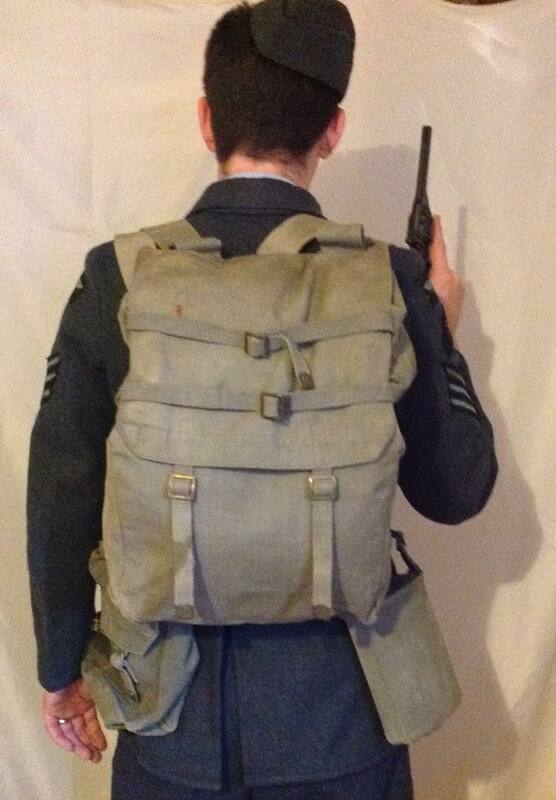 This entry was posted in British Army, Latest Pick Ups, Post WW2, Uniform on December 28, 2015 by hatchfive. The “Two Types” proved popular in the ranks, and were syndicated to other publications, including the Daily Express from 1944. However, they brought criticism from higher up. General Montgomery banned a cartoon showing one of them jumping into a slit trench at El Alamein as the German tanks approached, and saying to the other “When this lot’s over, I bet some ruddy General proposes a reunion!” Even more disastrously, Jones recalled, “General Alexander tried to ban me altogether, but Hugh Cudlipp convinced him that if he did, it would prove what the troops had always suspected – that some officers were pompous and humourless too. Alexander accepted that.” Jones was instead awarded the MBE. Jones drew only some three hundred “Two Types” cartoons between 1943 and 1946, but over a million copies of the wartime collections were printed. 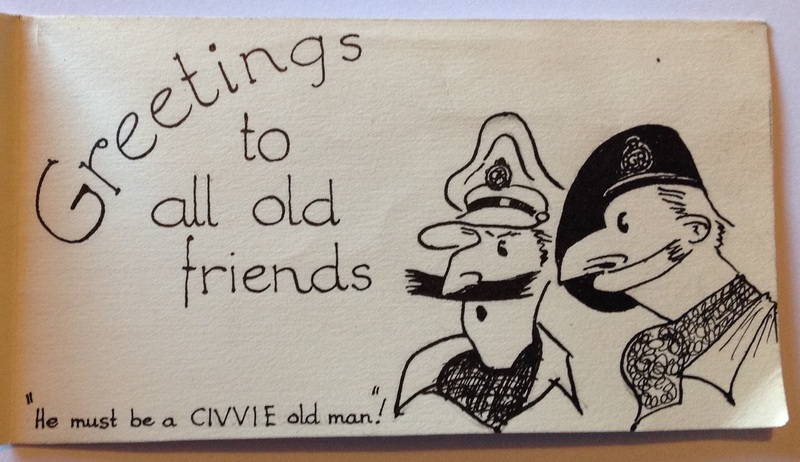 Clearly by 1946 they were well recognised archetypes and their inclusion in this Christmas card suggests the senders were still serving in the military. 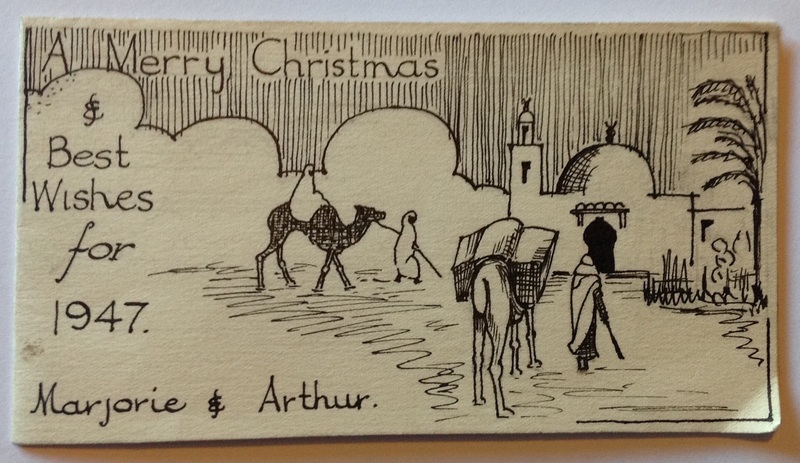 I am quite certain this card was not drawn by the original artist, but whoever did design it was clearly a fairly good amateur artist who has captured the characters well. 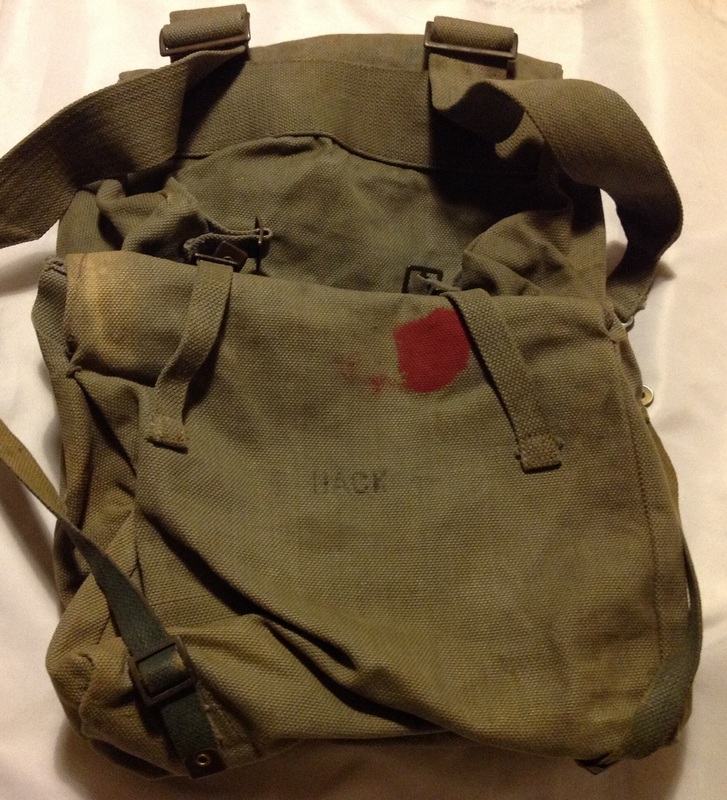 This entry was posted in British Army, Documents, Post WW2 on December 26, 2015 by hatchfive.